With so many free things in Copenhagen, you don't have to fall into the tourist trap and overpay. No, in Copenhagen, there are numerous free attractions and other things visitors can get for free...here are the best. The Little Mermaid sits close to the shore of the cruise harbor "Langelinie" on her granite resting place, in the old harbor of Nyhavn. It is a short walk from the main cruise pier, nearby many of Copenhagen’s other major attractions. The changing of the guard in Copenhagen takes place every day at Amalienborg Palace, no matter what the weather in Denmark might be like. While guards change positions every two hours, the main event for visitors is the changing of the entire guard at noon. The King’s Garden (Kongens Have) at Rosenborg Castle in Copenhagen is Denmark's most popular royal castle. Look for the Hercules Pavillon and the statue of Hans Christian Andersen. In the summer months, there are puppet shows for children and the lawns are crowded with sunbathers. Here's a free city center map of Copenhagen for you, for print or download. In Copenhagen, the bicycle is one of the most popular methods of transportation, and CityBike is Copenhagen's free service that lets you use bicycles at no cost (except for a single coin deposit that you get back upon drop-off). You should definitely give this great service a try! Use Expedia's flight search engine here to compare flight prices to Copenhagen or any other destination, any time. Copenhagen's architecture is something that you can enjoy in the entire city, absolutely free and at your leisure. If you'd like to see Danish architecture that is usually closed to Copenhagen visitors, visit Copenhagen for the Copenhagen Architecture & Design Days each May. 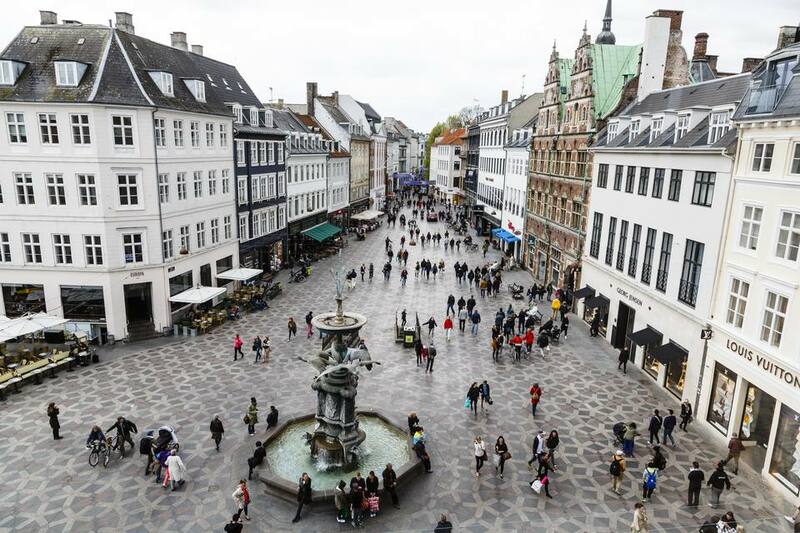 The Stroget is Copenhagen's famous pedestrian shopping area and is one of the major free attractions in Copenhagen. If you're not a shopper, you'll have no issues visiting the Stroget without spending a single Kroner. If you do like to shop, though, start at the Rådhuspladsen end of the Stroget - things are cheaper there!